Hyaluronic Acid is a natural compound produced by your body that aids in keeping your skin moisturized and looking youthful. As you age, the body’s production of hyaluronic acid decreases year by year, allowing your skin to become drier and fine lines and wrinkles to begin appearing. Replacing some of the hyaluronic acid your body has lost can help keep your skin healthy and reverse some of those signs of aging. Holds in Moisture– Hyaluronic Acid forms a barrier on the surface of your skin that helps it hold in some of its natural moisture and protects it from the drying effects that environmental factors can cause. Stimulates Collagen Production– It also stimulates collagen production and promotes elasticity which is essential in maintaining a more youthful skin texture and appearance. Aids in Tissue Repair– It aids in tissue repair so that it can help to repair sun, wind and other skin damage. Plumping– It actually helps plump your skin, which aids in the filling in of those fine lines and wrinkles that have already appeared, leaving your complexion looking more dewy and youthful. When choosing products containing hyaluronic acid, like hyaluronic acid serums or hyaluronic acid creams, some consumers are not sure whether to buy products containing High Molecular or low molecular weight hyaluronic acid. 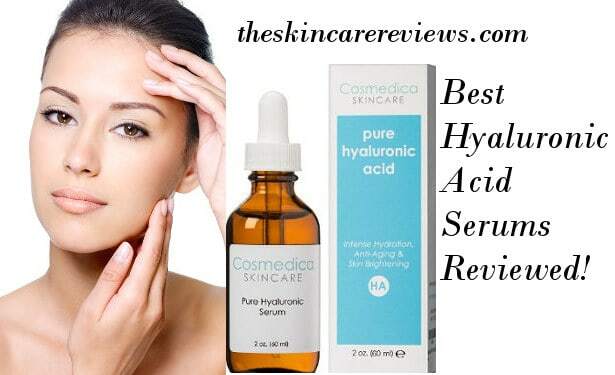 The simple truth is that high molecular hyaluronic acid absorbs and holds more fluid than low molecular weight HA. However, when used in skin care products, High Molecular (HA) can not be absorbed by the skin as the molecules are too large, so while they do form a protective layer on the outside of the skin, their lack of absorption does not allow the acid to either aid in tissue repair or stimulate collagen production. Low molecular weight hyaluronic acid on the other hand, is easily absorbed and can penetrate deeper into the skin where it can promote collagen creation and aid in tissue repair as well as help the deeper layers retain some moisture. When looking for a skin care product that contains hyaluronic acid, it is best to choose one that contains both high and low molecular weigh hyaluronic acid as that will give your skin double the protection from the HA. The High Molecular weight form of this acid creates an invisible barrier on the skin’s surface that holds in moisture and protects its surface from the drying effects of toxins in the atmosphere while the low Molecular form of this acid penetrates the skin for deep hydration and collagen stimulation. Choosing the right skin care product with both forms of Hyaluronic acid will do the most to repair your skin and help to fight signs of aging.